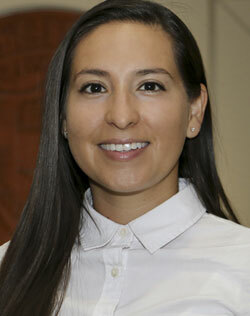 Andrea Ortega (pronouns: she/her) is a Counselor in the Counselors in Academic Residence (CARE) Program, a program that provides mental health services in academic offices to facilitate students' academic and life goals. She provides clinical services students in the College of Natural Sciences and is also available to provide prevention and outreach and consultation services to CNS faculty and staff. She is passionate about working within CNS and has an affinity for working with the college’s inquisitive and analytical students. Areas of professional interest include trauma, mental health and technology, advocacy around multiculturalism, diversity, and inclusivity, mindfulness, and the interpersonal effects of family dynamics and experiences. Andrea works from an eclectic model that incudes interventions and framework from CBT (Cognitive Behavioral Therapy) and ACT (Acceptance and Commitment Therapy) with a strong emphasis on advocacy and collaboration. She enjoys working with millennials and first-generation students and has an adept understanding of acculturation and multi-generational issues. Students are primarily referred by CNS staff or faculty member. Students interested in learning more about resources to support their mental health can contact Andrea directly. Available to consult one-on-one and in meetings/groups. Please contact Andrea for more information.